A DataMatrix Code (DMC) is already included in the inner layer production. But what about the marking when the inner layers of a multilayer printed circuit board are repeatedly covered by additional outer copper foils and are no longer legible? For this purpose, each panel must have a label on the front foil. The previous handling with a classic, manually adjustable stamp was no longer up to date and sometimes caused quality problems and errors. With the REINER jetStamp graphic 970, the employee now has a handy and robust marking device directly at his workplace. 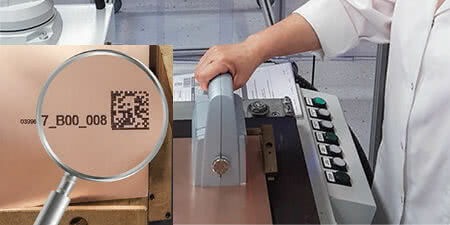 Easy to operate, with simple scanning of the data, jetStamp graphic 970 at Würth Elektronik ensures clear and always readable imprints.